3 - 3.............Jago von Beelen. 4,4 - 4..........Chico von Forell. 4,5 - 5..........Vello von Fürstenfeld. 4,5 - 5..........Kira von Romberg. 07/10/1990: 98-98-97 = 293 points (1st). 01/10/1989: 99-97-94 = 290 points (1st). Bino von der Westmark was the winner of the D.V. Meisterschaft in 1989 with 290 points and again in 1990 with 293 points. His sire, Nicolai vom Kloster-Kamp, was Belgian Working Champion, D.V.I.N. Working Champion and runner-up at the D.V. Meisterschaft while his maternal grand-dam, Cristel van de Eland, was D.V.I.N. Working Champion plus winner of numerous show championships. 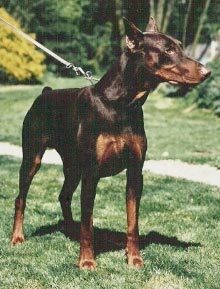 Bino's maternal grand-sire, Ben von der Eich, was the Landesmeister of Landesgruppe Westfalen in 1982 with 287points.